Gone are the days that women are defined by the same ole marital roles. In fact, 21st century roles are more fluid. At least for some. Women these days are heads of households, heads of departments, CEOs of Fortune 500 companies and making partner in their law firms. Husbands these days are stay-at-home dads, the one who cooks the best and getting in touch with their feelings. This completely messes up the image of the man and his wife both carrying briefcases and checking their watches. Today's power couple might be the CEO wife with children crawling around on the floor as she meets with her staff and the MD husband who prefers working at the local clinic than being in private practice. The point is not being equally matched in career choice or merely looking the part, what true power couples know is the foundation of their union is a strong strategic alliance. I was talking with Hire the Web's Lorrinda Michieka about this not too long ago. We were talking about my upcoming annual summit, You Asked? Good Men Answered! when she said that she is looking for someone she can have a strategic alliance with. At first, it sounded very scientific and businessy, but as we explored it further, it made perfect sense. A power couple is committed to the same vision for their relationship. It goes underneath the skin of appearances to the heart that beats underneath. It goes deeper than raising the kids together. It's being intentional about the type of relationship you want to have. It's not very romantic, but in the words of Dr. Phil, "How is that working for you?" So, you're waiting for that tingle running up and down your spine. How is that helping your love life? How is that leading to long-term commitment? One thing's for sure. While the roles of men and women are changing, the biology has not. Women still have more estrogen than men. And men have more testosterone than women. Those chemicals do affect our responses and way of being in the world. No 3-piece suit or Rolex watch can change that! Power couples know how to leverage who they are to build a partnership that supports the other. Our 2017 You Asked? Good Men Answered! Virtual Summit will focus on what's behind the mask, helping women better understand a man's language and a man's culture. Check out our audio archives from 2015 and 2016. 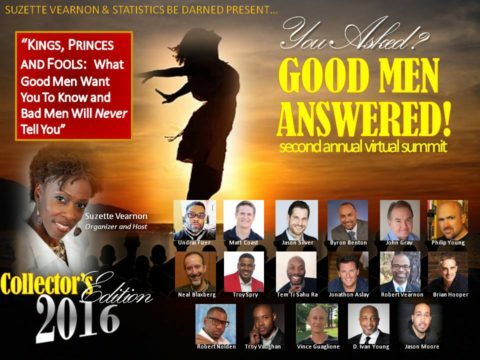 Featured are Jonathon Aslay, Tem'Ti Sahu Ra, Mars Venus John Gray (yes, that John Gray) and many more insightful men. ⟵Should You Start A Company In Uncertain Times?